We are a leading supplier and trader of Fire Fighting Double Headed Hydrant Valve. Our offered products are Fire Extinguisher, Hydrant System and Fire Sprinklers. 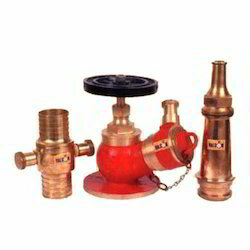 With an increase proportion of technology, we are trading and supplying a qualitative assortment of Fire Hydrant Valve. Manufactured at our vendor's end using premium quality raw material and advanced technology, this product is designed with high precision in order to meet the international standards. Furthermore, our quality experts strive hard in order to supply the flawless range of products at the clients’ end. We are looking for queries from Maharashtra. Being a customer oriented firm, we are engaged in offering a wide range of Fire Hydrant Valve. It is manufactured using best grade raw-material and latest technology in synchronization with industry standards at vendors' end. In order to make certain of the quality, the entire range is meticulously tested on different parameters by quality examiners. Keeping in mind the diverse necessities of our clients, we provide entire assortment in different sizes and specifications at affordable price.